We are big fans of the pepper steak, but sometimes, the steak can be a bit tough and even a little tasteless. 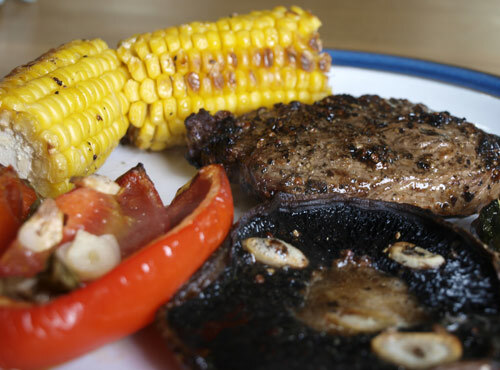 So I thought I would see if I could improve this simple dish with a tasty marinade to tenderise the meat and add flavour to the steak. 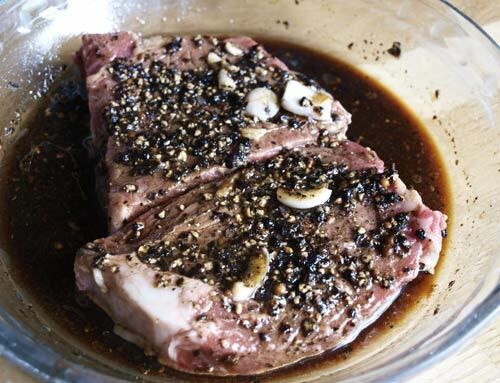 Combine all the ingredients to make the marinade and marinate the steak for at least 2 hours. Drain the marinade from the steak and grill 3-4 inches from the heat until cooked to your liking. I served the steak with corn cobs, steamed then place in a parcel of foil with seasoning and butter and baked in the oven. Also red pepper with tomato, garlic and basil basted with olive oil and roasted. The field mushrooms were dotted with butter, sprayed with olive oil spray and roasted too. The whole dish was quite delicious, the marinade was incredibly tasty, you could not have known that there was soy sauce in it, every flavour conspired to enhance the flavour of the steak and it was butter tender. This one is a keeper! This marinade looks absolutely delicious. I'm guilty of often wanting to use marinades but when I get back from work there's no time so I go straight to the cooking stage. Being organised enough to do things like this is definitely one of my aims. Sometimes simple ingredients work out best. The steak looks very delicious. Love your meal. Looks delicious and my mouth is watering, Janice. Lovely touch with the soya in there, too.